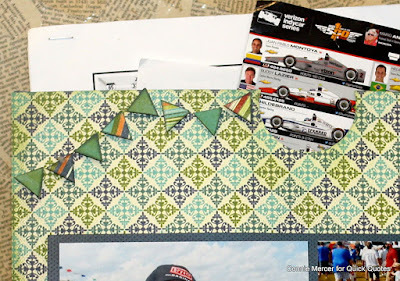 Blog Quick Quotes: Memorabilia Page with Connie! Hi, Connie here with a scrapbook pocket page using the Earth Wind Fire collection (released soon) by Quick Quotes. 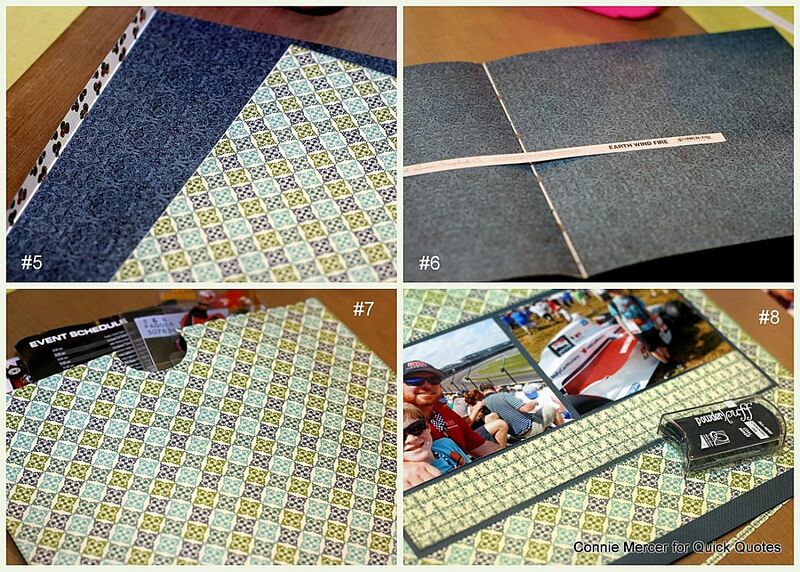 I was asked to keep the memorabilia with the photos, so I came up with this pocket page. 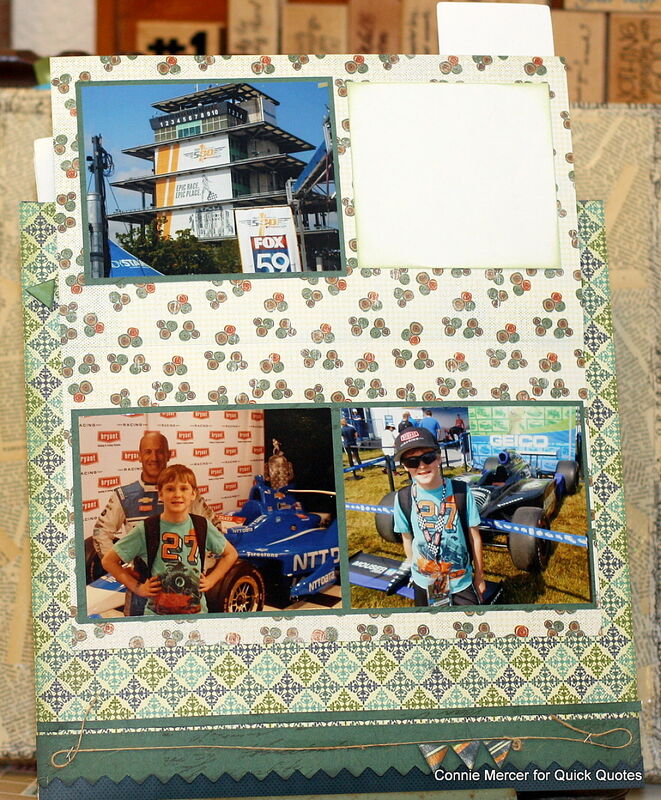 I started with five photos and a bunch of memorabilia from the Indy 500. One of the brochures was heavy and thick so I needed something that wouldn't pull apart. You will need two pieces of the same pattern 12 x 12 paper. Cut the selvage off the bottom. Cut a one inch strip from a coordinating pattern in the collection. Score down the middle. 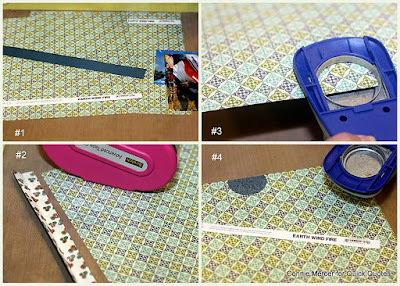 Adhere strong adhesive on one side of the one inch strip and lay the pattern paper in the slot. See #2 in collage. Do the other side the same way. You have med a hinge that won't pull apart. See #6 in collage. 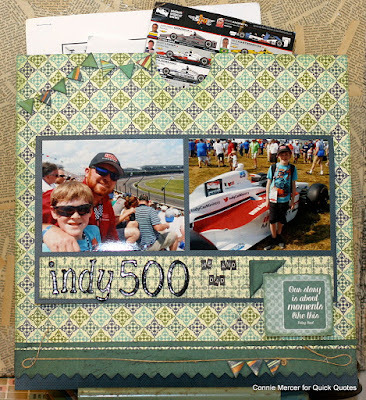 Before we make the pocket, go ahead and punch out a one inch half circle, making it easier to pull out the memorabilia in the soon to be pocket page. See #4 in collage. Adhere each side with strong adhesive and clamp. Let dry and set. 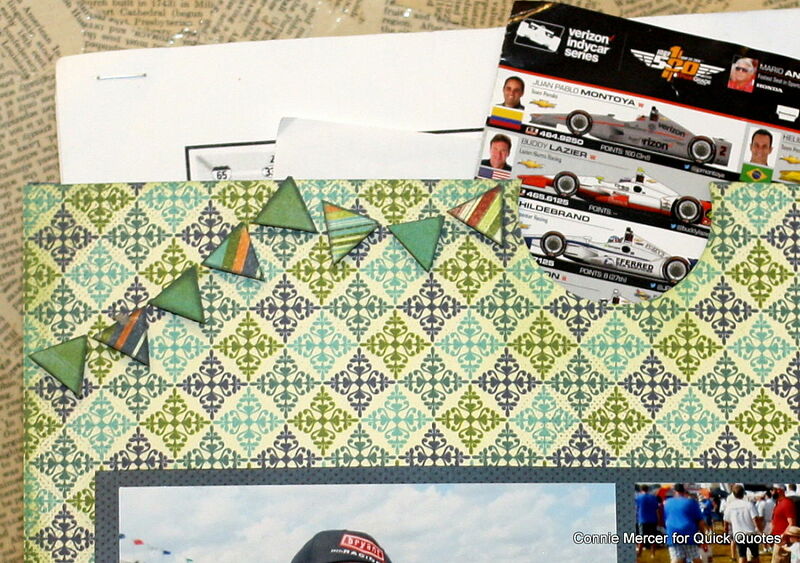 By doing the hinge at the bottom, the pocket page won't come apart even with heavy memorabilia in it. The front of the pocket holds 5 photos. Two on the outside and three on the inside. Make the fold up the size you need it, kinda of like a card, folding up to reveal the other photos. I will have my son journal the event on the white space at the top. Other: Stickers, Twine, Corner Punch and Beacon 1-IN-3.